Full hand-sewn bespoke made to measure tailoring strictly handmade in Napoli, Italy. 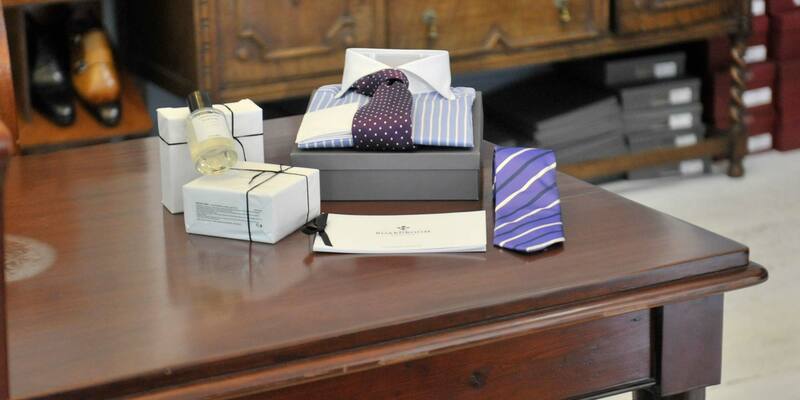 Suits, coats, jackets and trousers all custom made to order complimented by a range of seven-fold silk ties. Fabrics supplied by Loro Piana and Ariston among others. Made to measure custom tailoring and shirts in fabrics from Holland & Sherry, Dormeuil, Vitale Barberis, and Thomas Mason among others. The personal tailoring is complimented by a range of ready to wear raincoats, jeans and chinos – all made in Europe. Eves & Gray’s passion lies in developing new and exciting personalities for classic and iconic styles of hand-crafted shoes and boots, including the infamous Hellcat model. The Eves & Gray eclectic mix of luxury shoes offer the most discerning dapper gent an excuse to add to his collection. Timeless ready to wear pieces to enjoy now, and for years to come.